Lichfield Cathedral in Staffordshire, England stands in an elevated location and dominates the surrounding city. It is an active place of worship which balances well the needs of a modern congregation whilst embracing the history of the surrounding building. There has been a church on this site for over 1300 years and today’s cathedral does not disappoint. When you enter through the main doors, the huge Nave is the first thing you see and the cavernous space here is big enough to cope with large gatherings. Make sure you look up at the impressive ceiling too! Down each side of the nave are small seating areas, each with a hand-made cushion naming the collections of parishes which make up the Lichfield Diocese. Take time to visit the Chapter House which was built in the 13th century. It’s here that cathedral business was conducted, but aside from the seats around the outside, it is also used now as an exhibition space. When we visited, there were parts of the famous ‘Staffordshire Hoard’ on display. Elsewhere, look out for the Lady Chapel at the back of the Cathedral including the Shrine of St Chad and the Quire, where you’ll find an ornate screen depicting angels. Outside the cathedral, the close is also worth exploring where you’ll find the gift shop and the cafe along with some of the administration buildings. 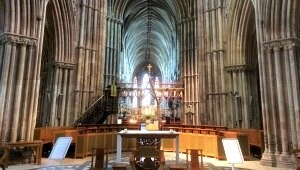 Lichfield Cathedral is open daily from 8.30am to 6.30pm Monday to Saturday and from 7.30am to 4.30pm on Sundays. Admission is free. Tower tours are also available.